I just came across a fantastic new 'thing' on the NLS maps website, where you can look at the 1898 Ordnance Survey map cross-checked with the current bing maps to give it a historical context. So when I was playing about earlier, looking at the parts of Falkirk that I do not have on paper I came across a couple of grounds, some of which I am not sure about and will need to research a bit further, but some I knew but had never looked at on the map. Football in Falkirk District started in Bonnybridge, but although they were enthusiastic the Grasshoppers never quite had the ability challenge on the field of play. As a result of this they never really managed to establish themselves so paid the ultimate price when the great cull of village clubs came in the wake of professionalism and league football. Local knowledge has it that Grasshoppers' first ever match was played on a the field where Bonnybridge Library now stands [sometimes known as Bonnyside]. Exactly where the Grasshoppers played over the next couple of seasons is difficult to pin down. 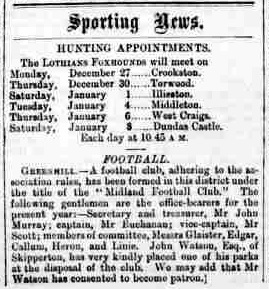 Occasional match reports state "Peathill" whilst others state "Highland Dykes" and whilst it is possible they were the same ground it still only vaguely locates it to the area about modern Larbert Road in Bonnybridge. Around 1880-1881 Grasshoppers moved to what would be largely their permanent home for the rest of their history: Milnquarter Park. The club had relocated to the, then, largely vacant, fields between Bonnybridge and Greenhill. 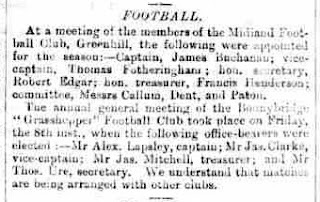 I say it was largely their permanent home because they spent season 1886/87 in Longcroft. Since I have never come across any descriptions of the actual ground in any match reports I do not know what it was like, but it is fairly safe to assume it was very basic, probably just a roped off area in a field, the teams getting stripped in a nearby pub or similar hostelry. In the map [below] it is quite a bit off the local roads, this would affected access, and the fact that there was unlikely to be any Grandstand would have made it virtually impossible for the club to charge the any crowd for the privilege. According to the OS map it seems that the ground was partly built over the Antonine Wall, which leads one to presume that at least that part had been dismantled by 1880. Another thing which is missing from this map which is in later maps, is that the land immediately to the East on the other side of the railway lines was the home of Bonnybridge Cricket Club, part of which is now the playing area of the Antonine Primary School. Although Milnquarter was never the greatest of grounds in the district, it was important enough. Several Scottish Cup matches were played on the ground, so we can tell that the ground was up to scratch in the eyes of the SFA, there are countless recordings of teams being forced to replay matches, or play matches away from home simply due to the quality of the ground. I must admit to ignorance at this point though, I am not completely sure if the ground was shared in latter days with Bonnybridge Juniors, and even if so, how long football was played on the ground after Grasshoppers became defunct. I will get round to looking up these things in time, but for the time being I'd like to think that the ground was at least being used in the Junior Cup matches until it was finally built over.